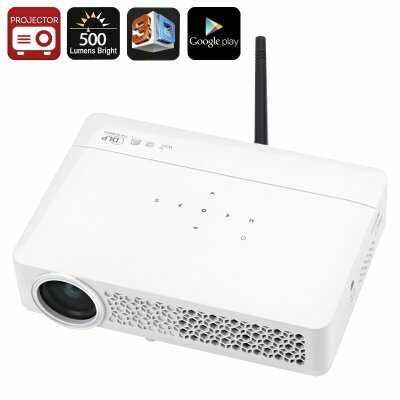 Successfully Added Portable Android DLP Projector - 3D Movie Support, Android OS, 500 Lumens, Google Play, Build-In Speakers, Quad-Core CPU to your Shopping Cart. Bring hours worth of mobile fun and online entertainment into your household or office with this mini portable DLP projector. Running on an Android OS system this mini projector lets you browse the web, stream the latest movies, play games, and download apps straight out of the Play Store. This 500 Lumens Android projector has a throw distance of 1-10 meters, making it the perfect device to be used in small office spaces, living rooms, or bedrooms alike. Featuring a Quad-Core CPU that has been clocked at 1.15GHz this portable projector is capable of smoothly handling your daily demands. Along with a Mali-450MP graphic unit, this DLP projector is capable of portraying stunning graphics and vivid colors, letting you enjoy all media and games to their absolute most. Supporting up to 32GB of external memory you can be assured that there will always be enough storage space for you to save all your files and media. So had out to the Play Store and download the latest online games and movies – with this mini Android projector you can be assured that you and your friends will never experience a single moment of boredom again. Thanks to its Digital Light Processing (DLP) technology that uses a large amount of microscopically small mirrors to display imagery and videos, this projector is capable of portraying high-quality images that feature a wider color gamut. Additionally, this technology supports magnificent 3D video, making it possible for you to watch the latest 3D movies and enjoy a true cinematic experience from the comfort of your own living room. So sit back with a bag of popcorn and enjoy a relaxing movie night with all your friends or family - with this cinematic Android projector you’ll be sure to impress your loved ones with a stunning 3D media experience. Featuring built-in speakers and supporting surround sound audio this portable Android projector delivers great audio quality that further adds to your overall user experience. Bluetooth 4.0 furthermore allows you to connect your projector to external devices such as additional speakers, allowing you to experience a true audiophile grade audio experience while enjoying your online media. With a noise ratio of merely 25dB this Android projector features an extremely quiet design, letting you peacefully enjoy all your favorite movies and games alike without being interrupted. This portable Android projector comes with a 12 months warranty, brought to you by the leader in electronic devices as well as wholesale electronic gadgets..